Astra and Petrolul went all-in. Can Steaua defend the title? Bourceanu leaves a hole in Steaua’s midfield. With two games in hand, which will be played before the restart of the league, Steaua not only has the chance to get back on top of the standings, but also to be the first to get used to official matches. It will surely come handy, as the Bucharest side had a terrible pre-season, as far as results are concerned. Can go well if… Steaua was just a machinery running out of gas. Can go bad if… The motivation isn’t just the same. Too many regular starters will be thinking about the summer mercato. The defense will be left only with the protection of Pintilii, as Reghecampf has enough reasons to replace the departed pitbull with a more offensive midfielder. Not rated among the contenders at the beginning of the season, Astra managed to gain a lot of points and respect during the first half of season. The wealthy owner and an old fox in charge of the club have made up for the coach’s lack of experience with a winning team, which can still come to work against the club as the finish line will get closer and the pressure will reach levels never touched before by Daniel Isaila and most of his players. Can go well if… The chance to go all the way will keep on inspiring the team & won’t instill fear. The inexperienced Daniel Isaila has that special something to take up such a challenge and see it through. Budescu will create play and score goals at the same rate as in the 1st half of season. Can go bad if… The owner won’t be able to control his level of interference. 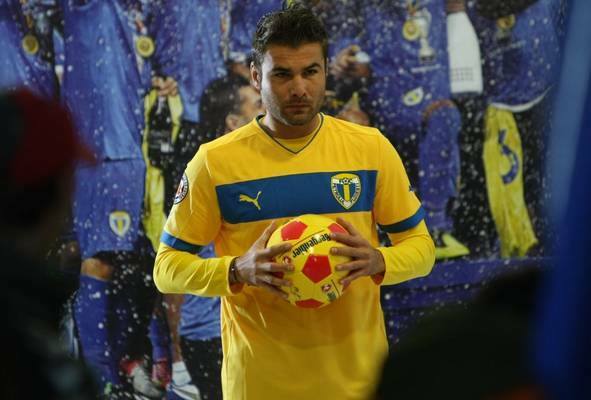 Leadership and goals, that’s what Petrolul expects from Mutu. Mutu’s arrival was the winter mercato’s big and unexpected hit. Image, mood, perspective – all changed for Petrolul, but things are not as bright after one month, with the financial support of the Local Council currently on hold, some interest from abroad in Cosmin Contra’s work and an intense transfer activity that can work both ways… Petrolul might have signed one/two (falling) stars, but was forced to sell a proven goalscorer like Younes and no less than 3 other players who, for bad or worse, did play an important part in the team’s excellent 2013. With fantastic support and a winning aura at home, Petrolul will have to do better on the road and start turning more draws into wins. The extra class in their attacking midfield might help out, but will the defense be able to hold on? Can go well if… Mutu and Zicu will be in the mood to show their class. The away form will improve. The attack will compensate for the defensive fragility and lack of backup. Can go bad if… Financial problems will surface right away and the ownership won’t be able to hide them well enough until the summer. The lack of a balanced squad (poor backup un the flanks, average quality in central defense, no proven goalscorer available for the lone striker position) will be exposed. Dreaming to play for Steaua as a kid? Grow up! The reigning champions, the only Romanian club to win a European trophy, a constant presence on the European stage, the team with the largest fan base in the entire country and the only Bucharest “giant” still performing these days organized a try-out for kids born in 2002, 2003 and 2004. 14 turned up. A shocking number really, not only for Steaua, but for Romania. Still, the red and blue outfit, who is trying to revitalize its youth sector with Italian coach Massimo Pedrazzini in charge, must take a big chunk of the blame. Having a wealthy and impatient owner – he’s taking a course on this, now that he’s behind bars – has worked against Steaua in recent years. Used to pick the best talents from all over the country, Gigi Becali’s favorite toy made one attempt to build a proper academy some years ago. Of course, it was burning some stages and basically missing the point, as 16-17-18 years old were bought and integrated into the youth teams, so it’s no surprise, really, that Becali pulled the plug once he saw that a dozen of youth international actually went on to waste their talents under poor guidance and with no early shot at senior football.